Joanne Nvanungi Nalubega recently graduated from the inaugural 2017 Young and Emerging Leaders Project (YELP) class. She is an Industrial Chemist with a deep passion for technology. Joanne has previously worked as a website developer and content manager at Node Six, as well as a content editor for PC Tech Magazine. Joanne holds a Post Graduate Certificate in Applied ICT and Leadership from International Health Sciences University and is currently working as an associate on the same program to create a shift in mindsets, skill and tool sets of innovators and entrepreneurs using ICT for development. She is also a founding partner of a fellowship of creatives called Kafunda Kreative which seeks to build the capacity of young creatives using emerging technologies, to create collaborative spaces, opportunities and skilling to push boundaries in their different trades. Joanne was recently appointed as NEF ambassador to Uganda at the second Next Einstein Forum that was held on 26th to 28th March, at the Kigali Convention Centre under the patronage of H.E. Paul Kagame, President of the Republic of Rwanda. NEF was launched in 2013 and is an initiative of the African Institute for Mathematical Sciences (AIMS) in partnership with Robert Bosch Stiftung. The forum is a platform that connects science, society and policy in Africa and the rest of the world. The NEF believes that Africa’s contributions to the global scientific community are critical for global progress. At the centre of NEF efforts are Africa’s young people, the driving force for Africa’s scientific renaissance. 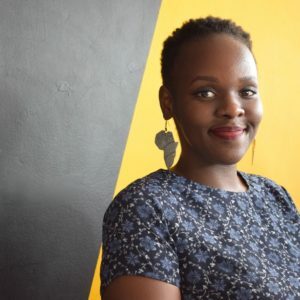 Nvanungi’s NEF appointment comes after her one year of leadership training with LeO Africa Institute under the Young and Emerging Leaders Project (YELP) in 2017. We recently caught up with Joanne to talk more about what the appointment means and what her role as a science ambassador for Uganda will entail. 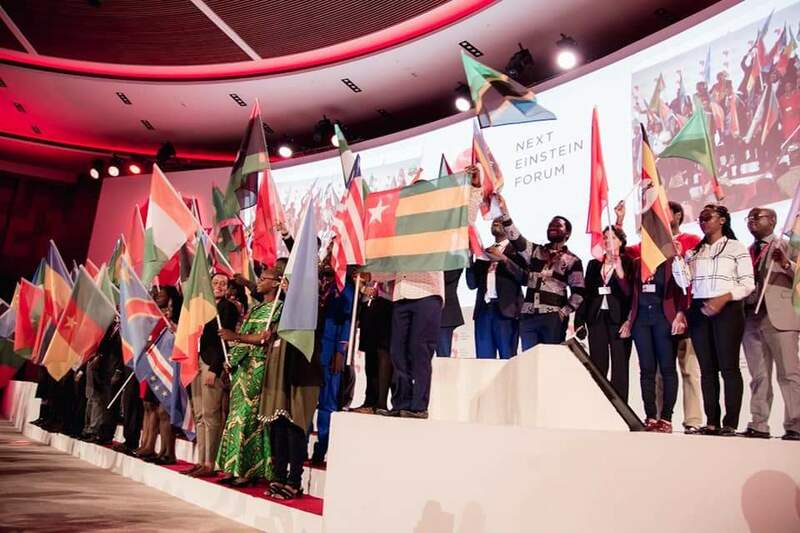 Joanne Nvanungi (second from the left) raising the Uganda flag at the Next Einstein Forum in Kigali. Hello Joanne, Congratulations on being confirmed as NEF ambassador for Uganda. What does the achievement mean to you as a leader? My appointment as NEF Ambassador to Uganda is an absolute honor which comes at a crucial point in my career and journey to becoming a better leader of myself, my country and ultimately the world. Carrying the torch to champion the development and innovation in Science, Technology, Engineering And Mathematics (STEM) towards the development of the African continent is an opportunity for us, Ugandan scientists and youth, to contribute to the growth of our home, and our way of life, together with the support of scientists from all over Africa and the rest of the world. It is also an opportunity for young scientists like myself to stand at the forefront of defining Africa’s next chapter and perhaps our very survival and we get to do this by investing heavily and interesting stakeholders at all levels in Uganda in the development of infrastructure and policies to support innovation in STEM disciplines. How exactly do you hope to exploit STEM and your ambassadorship to the benefit of Uganda? I look forward to working with the new Ministry of Science, Technology and Innovation to chart out useful frameworks for regulations, infrastructure and a complete enabling eco-system for scientists to contribute positively to national development. I am m pleased to note that Uganda already has many useful policies in place to foster innovation, especially through STEM. What are some of the ways that stakeholders at all levels in Uganda can be interested in the development of STEM in the country? First and foremost is casting a spotlight on indigenous scientific innovations in both rural and urban areas to open up avenues for growth and collaboration of Ugandan scientists. There are so many creative and problem solving STEM ideas buried away without any recognition or even relevant support. The work of these scientists can be supported and enhanced by recognizing such innovative efforts without waiting for the once in while international validation. Secondly, there needs to be more media coverage on activities of entities that are mentoring children of school going age in STEM, and how this is contributing to the grooming of future employees with relevant skills. I believe that such initiatives will birth a generation of graduates that are not just job seekers, but innovative problem solvers and this will greatly check on the unemployment levels in the country. In line with the above, it is important that stake holders are interested in the development of such STEM friendly entities by supporting to improve the existing ones and also working towards having more of such places/entities in the country. “Ambitious” is understatement if one were to define your current drive, Joanne. Do you think some of the lessons from YELP will come in handy on this new and challenging journey of leadership? YES. Definitely a yes! Particularly lessons on reflective and servant leadership from the YELP fellowship. These have been and will continue to be instrumental in my leadership journey. Those lessons are like a guiding light and point of reference in my journey to fostering scientific excellence and advocating for better policy and infrastructure development for innovation in science in Uganda. What are some of the things you hope to accomplish as a champion of STEM in Africa? I plan to work with private and public sector partners to promote development of STEM through policy advocacy for STEM, increase of awareness about indigenous STEM innovations in the rural and urban places in Uganda but also most importantly is to help young scientists come to the knowledge of the many opportunities available to them. Most of the young innovators in Science in Uganda, have no idea that there are places where there ideas can be supported in different ways. For example the many African Centers of Excellence at various institutions of learning where such scientists can have access to important STEM resources such as books, equipment and a likeminded network of people. Talking about opportunities for young scientists in Uganda, tell us about NEF and their agenda for STEM. How can our Scientists benefit from such an opportunity? On the surface of it, the work of the Next Einstein Forum (NEF) Fellows and community of scientists, who are some of Africa’s brightest scientists, is deeply scientific and might even come off as rocket science. Some of it is actually rocket science. But the one thing that stood out for nearly, if not every single person who attended the NEF global gathering last week in Kigali and had the opportunity of listening to any of the brilliant scientists is how purely human-centered all of their complex research is. People are definitely at the center of the work of NEF and consequently that of its fellows. We had the rare honor of sitting in stunned silence, punctuated lightly by occasional applause as the fellows described the various ways they were using and advancing common and complex mathematical and scientific concepts to alleviate some of our world’s most pressing problems. These scientists have found a way to transform numbers into solutions bound to change the very way we live, treat the sick and our very genetic makeup for better. Uganda’s young people get to be part of that change, of Africa’s potential exponential growth. That is an opportunity that we cannot take lightly. It is such opportunities that our young people should know about and invest heavily in understanding what part there is play for them. Thank you for your time Joanne. Congratulations once again, and everyone at the Institute wishes you all the best as you embark on this exciting new role as NEF ambassador for Uganda. We hope the lessons learnt from the YELP fellowship will come in handy as you go along. Learn more about NEF and how to apply to be ambassador here.